This beautiful BEACHFRONT CONDO has just been completely redecorated with fresh paint, new furniture, stainless appliances, and professional decor throughout. (photos were taken June 1, 2018) Be one of the first to enjoy this gorgeous 2-bedroom, 2-bath home on the coveted Penthouse Level of Beach House Condominiums. From your 6th floor balcony, you can enjoy amazing views of the gulf and the silky white sand beach -- prepare for stunning sunrises and glorious sunsets! Beach Service is also included! March 1-Oct 31 you'll receive 2 chairs and 1 umbrella set up on the beach for you each day! Because this home sleeps 7 people, it is perfect for 1-2 families with children or up to 6 adults max. This home features a wonderful open layout with brand new comfortable furniture including 2 sofas (one is a queen sleeper) and a side chair -- you can enjoy a water view from every seat -- or enjoy the large flat-screen TV with cable programming. The open dining area also takes advantage of the view! You can serve 6 at the new dining table, and 3 more at the kitchen bar area. Amazing beach views (imagine the sunsets!) and ocean breezes await you on your private penthouse balcony! The beautiful open kitchen is perfect for preparing your favorite vacation meals, beverages, and snacks! It features granite counters and brand new stainless appliances. You’ll find all the dishes, pans, and utensils you may need, a Keurig D-Cup coffee maker (and regular drip coffee maker), toaster, blender, and even a few spices, to get you started. We want you to feel at home, and the open layout is a perfect gathering spot for your family or friends. For the convenience of our guests, we have also included a full-size washer and dryer. You’ll even find an iron, ironing board, broom, and a few cleaning supplies. We keep our homes clean and well-updated and pay attention to amenities you'll need, such as high-speed internet (FREE WiFi), nice flat-screen TVs, big, fluffy bath towels and hair dryers in each bathroom and more. All beds are made with brand new cotton quilts and 100% Egyptian cotton sheets We also provide items our smaller guests may need like a high chair and pack-n-play. This beautifully decorated retreat invites you to RELAX - it features a comfortable king bed and all new furniture, including side tables and a large dresser and closet to store your things while you make yourself at home here. You’ll definitely appreciate the OCEAN VIEWS from this bedroom! There’s also a flat screen TV if you want to check the news or watch a movie and lamps in case you want to curl up with a good book. You’ll appreciate the PRIVATE ENSUITE bathroom for the King Master Bedroom. There is plenty of storage and counter space in the extra large vanity. It also features a commode and convenient tub/shower combination. Featuring a queen bed and twin bed, this room is perfect for singles - or perhaps parents and a child. Light flows in from the abundant windows - but if you’d like to take a nap, or watch a movie on the flat-screen TV, just close the room-darkening curtains! All new furniture and decor include a dresser and a bedside table with lamp. There’s a nice closet for storage and an attached bathroom. This well-appointed full bathroom is accessible from the Queen/Twin bedroom, and has a separate door to the Living/Dining area. It features a large vanity with plenty of storage and counter space, commode and tub/shower combination. Beach House Resort features a large beachfront pool (seasonally heated) and there’s even a kiddie pool - you have a nice view of these from your penthouse balcony! Additional amenities include a Fitness Center, Lighted Tennis Courts, Shuffleboard, Outdoor Grills (both gas and charcoal) and a Video Game Room. Perhaps best of all, you’ll enjoy 650 feet of PRIVATE BEACH! Beach Service is also included! March 1-Oct 31 you'll receive 2 chairs and 1 umbrella set up on the beach for you each day! 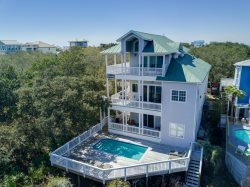 Beach House is perfectly located on Scenic Gulf Drive in beautiful Miramar Beach, between Destin and the attractions along Scenic 30A in South Walton. Shopping is very close by at Silver Sands Premium Outlets or at Grand Boulevard in Sandestin. You'll also find fine dining, fun nightlife and retail boutiques in nearby Baytowne Wharf. Destin Commons, a beautiful upscale shopping and entertainment center, is not far away. It features over 75 shops and restaurants, including Bass Pro Shop, World of Beer, Uncle Buck's Fish Bowl & Grill, AMC Theater with IMAX and much more. We offer a small number of first-class vacation homes in the Destin area. We take very good care of our homes and our guests. No one offers better homes than we do. We're local and will stop by and say 'hi' so we have to be proud of our homes. We know how difficult it is to find a vacation rental to suit your family’s needs, schedules and budget. We’re happy to assist you with the process of finding and booking the right place to stay for your vacation. We don’t leave you hanging—we do our best to get back to all email inquiries within an hour (and if you put your phone number into the inquiry form, we will call you)!. If this property is booked, ask about our other properties in the Destin area.